On a brisk evening in late March, Pittsburgh Mayor Bill Peduto was holding court over beers at the head of the table in a bustling downtown restaurant called Ten Penny. He had just finished emceeing a bus tour for a motley assembly of real estate developers, political consultants and urban professionals, brought in from Washington by liberal-leaning think tank Brookings Institution and Carnegie Mellon University. Flanked by Brookings vice-president Bruce Katz and James Garrett, dean of Carnegie Mellon’s College of Engineering, Peduto was wrapping up a conversation with Katz about a plan to bring a Slovenian LED manufacturer to the city and replace all the city’s streetlamps with LEDs, when Garrett saw his opening. Two days later, the idea had already made it into one of Peduto’s speeches. “We have the ability to put little cameras on the bottom of our police cars’ bumpers, because they drive the streets every day up and down through the neighborhoods, and be able to read what the street is telling them,” Peduto told attendees of the city-run Civic Leadership Academy, a 10-week course educating citizens on the workings of local government. A stray comment made over a beer had very quickly become part of a very public conversation about modernizing the city. By early May, Laura Meixell, the city’s first data and analytics manager, was in the final stages of an agreement to install the cameras on the undersides of public-works and police vehicles within months. The city plans to start using the cameras as soon as this fall. City bureaucracies aren’t exactly known for speedy movement, but for Pittsburgh’s newest mayor, sworn in at Heinz Hall performing arts center in January, making things happen is a way of life. In the first 100 days of the Peduto administration, the new Mayor got an open data bill through City Council and established a Department of Innovation and Performance. He started the ball rolling on funding for universal pre-K education and an ambitious affordable housing program. He appointed a prominent bike advocate, Scott Bricker of Bike Pittsburgh, to the regional planning organization, announced a plan for the city’s first downtown bike lane, and fired the Department of Public Works head so he could put in a more cycling-friendly manager. Peduto cut free employee parking perks by 90 percent and reduced the number of employees with take-home vehicle privileges by 30 percent. He signed a bill creating the city’s first land bank and published its first-ever report on carbon emissions. In those first 100 days, it became clear that the 49-year-old three-term councilman would be a different sort of mayor for Steel City — an upstart progressive leader unafraid of ruffling feathers. How long the party will last, however, no one knows. Peduto has built quite a head of steam around his nascent administration, yet the political coalition that brought him to power is the first of its kind in the city. The success of this mayor will turn on his ability to prove himself to a public that hasn’t trusted local government in a very long time. Bill Peduto was not supposed to win the 2013 mayoral election. The Pittsburgh economy was one of the lonely bright spots in America’s grindingly slow climb out of the Great Recession, and the incumbent, Luke Ravenstahl, was young, telegenic and well-connected. Plus, Peduto had already lost the race to the mayor’s office twice before, including to Ravenstahl himself in 2007. From 10,000 feet up, the fundamentals of the election seemed to predict a blowout victory for the incumbent, the grandson of an influential political boss and former state rep. But on the ground, something else was happening. The public was growing tired of their boyish mayor, and a brewing scandal had begun to taint his administration. In the fall of 2012, local media began tracking a story about secret police debit cards linked to an off-budget account at the police credit union into which officers had been depositing overtime pay from special events like sports games. Several months later, the news broke that Ravenstahl’s personal bodyguards also had the debit cards, and that Police Chief Nate Harper had full knowledge of the arrangement. (He’s now in federal prison in Illinois.) With the scandal swirling, Ravenstahl announced he would not seek reelection — just 11 days after entering the race. Peduto saw his opening and went for it. Together with his long-time field general Matt Merriman-Preston, an ambitious, data-savvy political consultant, the councilman mapped out a battle plan to take down multiple Democratic opponents, tapping the network he had built over decades of community organizing. He envisioned something broader and a little messier than the groups that typically rally around a Democratic candidate in Pittsburgh — a constellation of progressive issue-based groups, African-American voters, labor unions, the creative arts community and educated professionals. Many of the ideas Peduto campaigned on were pretty much what you would expect from any Democrat running for mayor in a major U.S. city in 2014: more jobs, pension reform, increased efficiency at City Hall. But there were outliers, idiosyncratic ideas that indicated Peduto was not your textbook Rust Belt Democrat. In a stroke of inspired geekery, the councilman — whose Twitter profile had, until recently, advertised him as a “speaker of truth to assclowns” — released one policy proposal per day for the 100 days leading up to the primary. The first one called for a sociological survey that would help government understand problems facing the city so it could develop tools “to bridge the divide between the two Pittsburghs and become one city with opportunity and prosperity for everyone.” Others proposed eliminating parking minimums, cutting the red tape around food trucks, increasing diversity in the police department and creating a “parking benefit district” that would charge a fee for parking in a given area and divert the money to a fund for the community. Peduto Urbanism attempts to square modern progressives’ goals for the environment, the economy and equity with a low-car urbanist agenda for land use and transportation, and a sober, even conservative approach to fiscal policy and public management. Peduto talks a lot about Pittsburgh as an “urban lab” to experiment with innovative ideas like universal pre-K and living-wage ordinances. It’s an approach that reflects Peduto’s place in a growing cohort of urban liberals who have married populist agendas with economic development platforms that prioritize smart-growth principles of density, transit-accessibility and livability. Peduto’s peers include Aja Brown in Compton, an urban planner and the city’s youngest mayor, Ed Murray in Seattle, Betsy Hodges in Minneapolis, Santa Fe’s Javier Gonzales and, most famously, Bill de Blasio in New York. 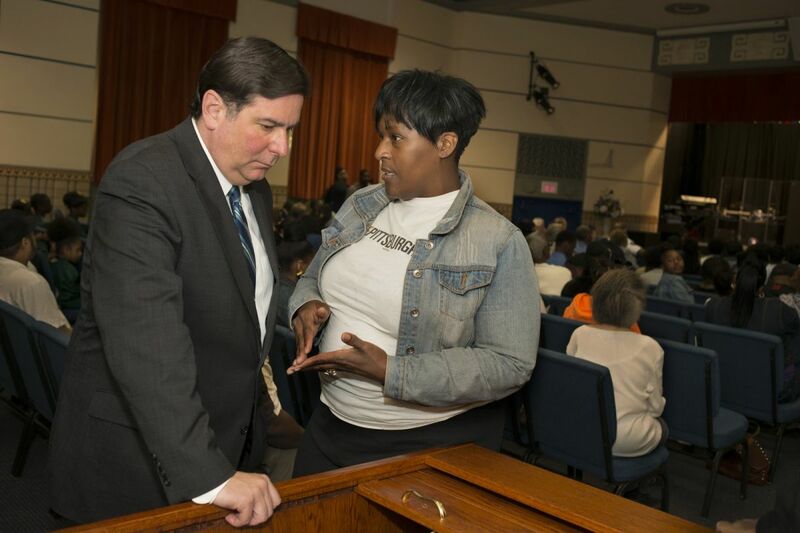 Mayor Bill Peduto listens Pittsburgh resident Troi Baldwin, who lost a son to gun violence, to during a public safety meeting in Pittsburgh’s Lincoln Lemington neighborhood. The time is right for this breed of pro-growth progressive. In Pittsburgh, for example, the population of young, liberal college-educated residents is growing after decades of decline and investors are taking notice. A hipster-luxe Ace Hotel is under construction, and Google, lured by a growing tech scene, recently opened an office in a 100-year-old Nabisco factory. Development is in the air. The growth, of course, brings excruciating questions that none of Peduto’s peers has yet answered, like how to allow for growth but not displacement, and how to give all residents equal say in the future of their neighborhood. That second question is one that Peduto has already staked a claim on answering. None of this was accidental. The groundwork for Peduto’s community-centered style of leadership was laid decades ago. Raised in a suburb not far from downtown Pittsburgh, Peduto moved to the city as a Mellon freshman on a full ROTC scholarship. Before long, poor grades got him bounced from the school and he enrolled at Penn State, where he switched majors five times in five years before dropping out three classes short of a political science Bachelor’s degree. The unmatriculated 20-something left school for a job in Washington, D.C., working for one of the early pioneers in the use of voting behavior analysis in political campaigns. But before long, he returned to Pittsburgh with his newfound electoral savvy. He started a political consulting firm, Allegheny Political Resources, and put his talents to use working for Democratic candidates across western Pennsylvania. At the ripe, old age of 28, he served as the political director for acting Governor Mark Singel. In 1995, he left Pennsylvania’s statehouse for the Pittsburgh City-County Building. Taking a job as chief of staff to Dan Cohen, a young liberal councilman from the East End, Peduto began to build a name for himself in the city’s close-knit political culture. In a short period, he became known as an ambassador of sorts between the Pittsburgh establishment and a budding scene of young transplants who were beginning to make an imprint in the city. These young professionals liked Pittsburgh for its urban character — its stately old buildings and diverse streets — so in the beginning, much of their activism centered around issues of planning, preservation and development. Peduto quickly found himself deep in a campaign to build something called the Ultraviolet Loop. Named after a character in an Andy Warhol movie, the loop was a bus circulator routed around popular bars and nightspots. Intended to keep people downtown at night — and not driving — the circulator gained the support of local foundations that initially underwrote the cost before passing it on to Allegheny County’s port authority. Though the bus only ran for two years before state funding cuts killed it, it became a symbol of possibility and change in the city. “The Ultraviolet Loop was the first visible sign that even mainstream organizations like the Port Authority were open to doing things differently, and that younger people actually could take leadership and do something,” recalls Pat Clark, one of the original organizers, and one-half of community planning firm Jackson/Clark Partners. It was also a sign that Peduto knew how to get stuff done. When Cohen stepped down from his seat in 2002, his staffer, then 38, became the youngest member of council. Significantly, Peduto won his first city election without the endorsement of the local Democratic Party organizations. One of his first moves in office was grooming his young activist friends for political leadership through a new fellowship he named after the powerful Seneca chief Guyasuta, who led French and British settlers through the woods of western Pennsylvania. Clark remembers other politicians being baffled at Peduto’s focus on young people at the time, since they tend to vote at lower rates. But the councilman wasn’t playing a short game of courting voters for the next election. He was playing the long game of movement building. “Where we are now is a direct result of what was started back then, and what was started back then was a direct result of those who decided to stay here in the ’90s,” Peduto said in a recent interview. 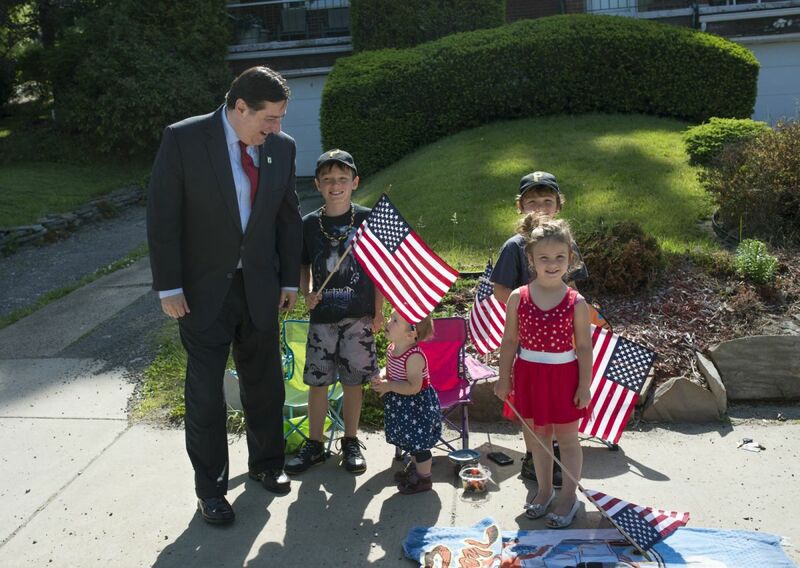 Mayor Bill Peduto pauses during Annual Memorial Day Parade in Pittsburgh’s Lincoln Place neighborhood to greet a group of neighborhood children. As a council member, he made friends across the city by pushing forward ambitious ordinances with impacts that a broad group would feel. He led the charge on an ordinance that mandated prevailing wages for employees on any project that received city funding, and one that required local hiring for the jobs in the Pittsburgh Penguins’ new arena. He got clean-air bills passed and crafted a responsible banking law that incentivized banks that do business with the city to invest in low-income areas. By Election Day 2013 it was very clear the movement building had paid off. Peduto won a definitive 85 percent of votes in the city. Sweat beading his brow, a look of dazed glee on his face, Peduto stood before a crowd of supporters at a victory party far from downtown, at a venue in a working-class section of the city called Homewood. Homewood holds a special significance for Peduto. After immigrating to Pittsburgh from Italy, his family opened a produce stand there. That early November night in Homewood, Peduto set the tone for his administration’s approach to urban development. He criticized his predecessors for using limited economic development dollars to subsidize downtown developers and shared a vision of safer neighborhoods connected by improved public transit and bolstered by new job-generating growth. “What we want to do is start to create plans for neighborhoods, and then go and find the developers that can do it,” Peduto told the crowd. Half a year has gone by since Peduto’s election night declarations. In that time, the Mayor established a Bureau of Neighborhood Empowerment, which focuses on bringing jobs and other opportunities to low-income neighborhoods through partnerships with residents and community leaders. The $500,000-a-year city department — created with the help of local foundations — is the first of its kind for Pittsburgh. The growth, of course, brings excruciating questions that none of Peduto’s peers has yet answered. Another new agency in the works is the Pittsburgh Priority Communities Commission, a legislatively empowered body that would be tasked with creating comprehensive redevelopment plans for six to eight development-hungry neighborhoods. Proposed by Councilman Ricky Burgess, a frequent Peduto critic, the new agency would work with Peduto’s administration to prioritize public spending in these needy areas, sending them to the head of the line for neighborhood planning assistance, increased capital budget allocations and redevelopment priority. Though Burgess and the mayor have sparred in the past, Peduto’s administration has signaled it will work with the councilman on the initiative. 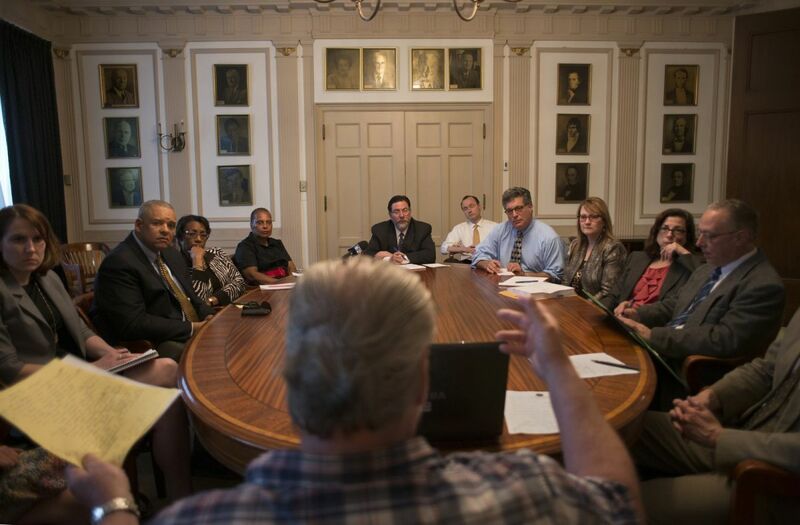 Peduto has taken other steps to improve the city’s responsiveness to neighborhood needs. One small move was requiring city departments to open accounts with Nextdoor, a private social network for neighborhoods that enables communication between residents and city workers. And he introduced a program of informal public meetings in his Pittsburgh City-County Building office. The meetings are open to anyone who wants to attend and are largely unscripted, with city residents raising issues and the mayor taking notes and directing the problems to the right departments. Mayor Bill Peduto and his department heads listen to a resident list problems with the crumbling infrastructure in his West End neighborhood during the first Mayor’s Night In at the City County Building. But of course, the bigger moves will be trickier — and likely involve tough political decisions. Talking about neighborhoods is one thing. Rebuilding them in an aging post-industrial city is another. “We stand on land that was once the home to 8,000 people and 400 businesses, that was taken away due to government policy,” the Mayor told the assembled wonks from the Brookings bus tour, looking out over the vast asphalt gash cleaving Pittsburgh’s towering downtown from the modest red-brick houses of the Hill District. The Hill District is ground zero for bad urban planning. In the 1950s, then-mayor David Lawrence sent black Pittsburgh packing from the area that had been the center of African-American culture in the city since the Great Migration. In 1955, the city began demolishing homes, small businesses, churches and schools. Five years, $22 million and 2,950 tons of Pittsburgh steel later, the city had the Civic Arena, a massive dome of a complex slated to host operas and other cultural events. In 1967, it became home to the Pittsburgh Penguins, the city’s National Hockey League team. By the aughts, the arena was outdated and the Penguins wanted to move. In 2011, demolition began on the enormous dome. Today, the site is a surface parking lot the size of a small lake — 28 acres. People park there while attending Penguins games at the team’s new Consol Energy Center next door, a major Ravenstahl administration project completed in 2010. The plan is to redevelop the site with hundreds of new units of housing, offices and shops. Peduto Urbanism attempts to square modern progressives’ goals for the environment, the economy and equity with a low-car urbanist agenda for land use and transportation, and a sober, even conservative approach to fiscal policy and public management. City politicians and neighborhood groups all want to see the Civic Arena site developed, but the negotiations are fraught with a powerful mistrust borne of decades of broken promises, disinvestment and plain old politics. Various factions can’t even reach agreement on objectives they share, a stumbling block that has delayed the project at least a year. Hill District leaders want to see more affordable housing included, while the developer, St. Louis-based McCormack Baron Salazar, says increasing affordable units will require more public subsidy. Before Luke Ravenstahl left office, he negotiated with the Penguins on a community benefits agreement for development of the old arena site. Many in the community felt like the agreement, crafted with very little input from area residents, was paving the way for yet another urban planning disaster. “The Mayor and the county executive shook hands, but they haven’t made an agreement with the community,” says Carl Redwood, chairman of One Hill CBA Coalition and head of the Hill District Consensus Group, a consortium of Hill community organizations. “They put it out like it’s a done deal without negotiating with anybody.” The current proposal, he says, is more of a “Penguins benefits agreement,” since the new arena will create millions of dollars in revenue for the hockey club while pledging little to the surrounding area. With the renewal of the Penguins’ development rights to the site coming up in October, Peduto sees an opportunity to reset the process by expanding the negotiating table and including the other elected representatives from the area, the full gamut of neighborhood organizations, and religious leaders. He has already dropped hints about the people he thinks must be included this time around. “The ministers are the glue in the community who can basically at any point say, ‘Hey guys, hey gals, what we’re here to do is find out what’s best for our neighborhood,’” he told me in March. Community benefits agreements already have a mixed record in the Hill District. Redwood’s group was formed during the negotiations over the Consol Energy Center, and it successfully negotiated the city’s first CBA with the Ravenstahl administration, the Penguins, Allegheny County and the two relevant city authorities. The Energy Center CBA succeeded in delivering several key goals from the Greater Hill District Master Plan like a Save-a-Lot grocery store, a non-profit employment center and a Hill District YMCA. But while it was largely a win for the neighborhood, a few missteps tainted the process. A major betrayal was a decision by the Penguins to renege on a promise to build a community rain garden and mural depicting Hill District history, neighborhood leaders say. At stake with the new CBA is thousands of local jobs and much-needed affordable housing. This time the process could be done right, Redwood argues. Elected officials in the Hill District and Homewood have not failed to appreciate Peduto’s interest in organizing in their territory, and are likely drawing parallels between his efforts there and the long-term capacity-building strategy he used to organize his East End base of professionals, urbanists and artists as a city councilman. Cheryl Hall-Russell is president of community service provider the Hill House Association. She chuckled at some of the drama that’s played out since January, and reflected on the political challenge for the new administration in places like the Hill District.